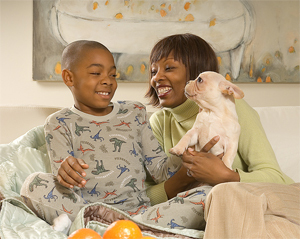 Choosing the dog that’s right for your family. If you are like many parents, you eventually give in— and face the task of choosing the right pooch for your family. With the myriad choices available, how does a person decide what breed or type of dog seems the best fit for a particular family? Before even thinking about which dog you should get, categorize your family. A family that enjoys going on long hikes, camping out and swimming at a lake house should not get the same breed of dog as a family that lives in an apartment building in the city and spends leisure time at the theater or curling up on the couch with a good book. Everyone has personal favorites. But in my professional opinion, the Labrador retriever is the perfect breed for an active or nature-loving family. If you want a dog to make sure your super physical, soccer-playing clan is wiped out and ready for bed at the end of the day, Labs are perfect for you. Labrador retrievers are fun-loving, family-oriented dogs that can’t get enough attention— or exercise. They generally love swimming, fetching balls and jogging a few miles with mom or dad. If your family sounds more like the second type mentioned, and you decide to get a Labrador retriever, beware! A Lab that is not given enough exercise finds destructive ways to channel excess energy, such as chewing up the carpet or eating mom’s new handbag. However, golden retrievers are another great family breed. They tend to be less energetic than Labrador retrievers. Golden retrievers are extremely affectionate and usually don’t mind playing dress up with your 8-year-old daughter and her friends. A new trend in dog breeding is designer breeds, which are first generation cross-bred dogs of a specific heritage. Two designer breeds that have great family appeal are the Labra-doodle and the golden-doodle. Both designer breeds have many of the qualities of Labrador and golden retrievers, respectively. And both are superb choices for a families with people who have been allergic to dogs in the past. This is because the “doodle” part of the mix is a standard poodle, which is a breed that does not shed, has little to no dander and, therefore, is generally considered hypo-allergenic. This trait tends to be passed on to most of the puppies in these two cross-breeds. Thus, you can be fairly confident that your allergic family members will remain symptom-free with a golden-doodle or Labra-doodle in the house. For families with less space or that desire a dog requiring less exercise, consider a bichon frise or a Wheaton terrier. These wonderful family dogs are smaller in stature. They are ideal animals to have in an apartment setting or for a family lifestyle that lacks abundant outdoor activity. Both breeds still love to tumble around and play with toddlers through adults. Some folks desire a dog that can fit in a purse. Also known as toy breeds, such dogs are adored by little kids who enjoy dressing up pooches and putting bows in their hair. If you’re looking for a very small dog, consider the Yorkshire terrier or miniature daschund. Both tend to be great with families and very tolerant of bows, dresses and even polished toes. However, these dogs do not suit families that play football in the living room, and nobody wants a Sunday afternoon emergency veterinary visit. Keep in mind, these are only a few of the hundreds of breeds that you might opt to welcome as your newest family member. Also consider adopting one of the millions of dogs at local pounds and shelters that are in need of a good home. Just first think about what kind of dog meshes with your family type. Then do some research on the breed you are contemplating before purchasing a pooch. In the case of an adoption, arrange a visit at the shelter with the entire family to aid in deciding whether your potential adoptee will be a good and safe fit for you and your kids. Once at home with your new furry family member, start the housebreaking right away. Behavioral problems, especially house soiling, is the leading reason that dogs end up in shelters and dog pounds, and in many cases being euthanized. Strongly consider crate training for your new pet. Because most dogs do not like to sit or lay in the same place that they have soiled, they will be more likely to hold having to go until being let out of the crate. Confirm the crate is not too big. Your dog should be able to stand up and turn around, but not take a walk in the crate. Many new dog owners are hesitant to make their puppy soil outside if weather is bad or if it is difficult to bring the puppy outside every time it needs to go, which is frequently when the dog initially becomes housebroken. If you wish to use wee-wee pads to give your puppy a spot to soil on in the house, look for the Potty Patch. The product mimics real grass and has an easy to clean waterproof base underneath the synthetic turf for collecting and disposing of liquid waste. The reason this is better than a simple cloth wee-wee pad is that dogs develop a substrate preference, meaning they become familiar and comfortable with soiling on a certain type of surface. Having the surface you are using indoors mimic grass makes it much easier for your dog to transition to outdoor bathroom trips. Following these suggestions makes the addition of a new furry family member most pleasing to your clan and your new dog, and gives you and your kids years of unconditional love to be enjoyed by all.